In last 2 years, I have never bought a ticket from anywhere else other than BookyMyShow. It is convenient, easy and takes very little effort for me to book a movie ticket. While mostly I book it on the web, I have increasingly started using their mobile app! 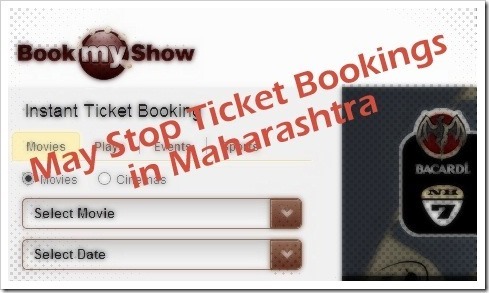 But according to a Hindu article, BookMyShow may pull the plug in Maharashtra thanks to Maharashtra state government’s order which came out in April of this year. According to the order, online ticket booking websites and theatres are not allowed to charge extra for the tickets sold online. Due to this order, sites like BookMyShow have to sell tickets without charging any service or convenience fee on top of the actual ticket price that needs to be paid to theatres. Since the order came out BookMyShow, Cinemax and PVR have stopped charging convenience charges, which has piled up huge losses for them in the state. Currently there is PIL in this regards in Bombay High Court and decision on the same is expected to come out in next few weeks. If the court rules in favour of BookMyShow and others, things will be back as usual. But it will be very interesting to see what happens if the decision comes in the favour of state order. Maharashtra is by far the biggest movie market in India. Although we do not have any confirmed numbers, it’s anybody’s guess that majority of the movie ticket sales comes from the state. I doubt if BookMyShow will actually stop the sales, because it will mean opening doors for others who may come up with creative ways of making money on online movie ticket sales. In our opinion, Bookmyshow definitely offers convenience to customers, but at the same time it also increases the reach of theatres. I think along with consumers, theatres should equally pay, rather than the whole extra amount charged to customers. We think Rs. 20, the convenience fee charged by BookMyShow to ticket buyers is tad too high. As a consumer, I would be happy to pay a fee of around Rs. 10, which is reasonable. But that’s just our opinion, we will have to wait for next few weeks to see what judgement Bombay High Court passes! This is brilliant. These people were minting money from common man. I dont think with the volumes these people generate charging Rs20 is small, rather it is significant. I would love to see their balance sheet to know how they are sharing the profit with cinemas and how much profit they are actually making. Any such decision will hardly have any impact cause there are so so many people. (Remember our population). whats the % of online sales against offline sales? do you think these are losses? or hit in their profit margins? even Rs.10 is also high. we are already paying entertainment tax and other things. I think they should charge for transaction ( If i book 5 tickets that should be considered as one transaction only). Also they are already making money from advertisements and if they think creatively they can make tons of money easily without charging movie lovers. Again I am not against charges as over all if time saved is considered then INR 20 to 30 is also not much. The point may be out of context but, AFAIK MSRTC charges a convenience fee when you book tickets online and the convenience fee is charged per ticket. BookMyShow is as bad a monopoly as IRCTC is. Both are very useful service but one is pita to use and other is extorting money from consumers. BMS has no competition and hence they are failing to innovate. I guess, theater owners too don’t want to bear convenience charges on themselves (on their own site too, they are charging fees, though a bit lower than BMS). Both parties are responsible to let down consumers who pay 100-300rs for tickets + 20-50Rs parking + damn expensive popcorn & soda. They have so many ways to monetize, but they have failed. Probably, they want the government to rethink the decision they made earlier. Personally, I don’t think the looses would be that high. Even, they can come up with something compulsory with the movie tickets. I was thinking on the same lines.. they can come up with 100 creative ways of charging the clients… They can keep something compulsory that you need to buy with tickets and make money like that.. This was already implemented in Hyderabad in 2009. BMS had stopped selling movie tickets online for long. They are back to full business now. Must have won some case somewhere. Babus’ just need to find how they can get the govt share out of BMS booty and once that’s clear they will allow. I too, love book my show and always book tickets there. But at some point, they started charging 30Rs per ticket, which is really too much – and not having ANY competition to them is also bad point here. There is nothing to complain about this service tough except that huge convenience charges. Yup…completely agreed… They need to bring it down to 10 or max 15.. This is sad. While I welcome the decision that the theatres themselves should not charge the convenience fee on their own websites, third party sites like BMS should be allowed to. Let customers decide what they want. Also I don’t mind paying a lump sum fee per transaction. If I am buying 5 tickets I should not have to pay per ticket. It makes more expensive for me. In that case I’d be better off going physically to the theatre and buying the tickets instead of paying 150 Rs. extra Just for booking it online. But Rs. 30 is very high, especially if there are 4-5 people going like you said..